Master Shredder is a professional files wiping utility. Files deleted by this software cannot be recovered by any third party software, even by special hardware devices (analyzing remanent magnetization of hard drive's surface). When you move your files to recycle bin, these files can be recovered - you know. When you do not move files to recycle bin, but just delete them - they also can be recovered by using special files unerasing third-party software - you know it. But when you format your hard drive - your important files can be recovered by other persons if they use special drive unformatting third-party tools - did you know it? Even if you deleted your files from hard drive, then formatted it, then zeroed whole hard drive using special software - even in this case your files can be recovered by using special devices analyzing remanent magnetization of hard drive's surface. So, what do you think now, when you sell your computer to other person or company, or donate it to school or just throw it out of the window? Do you really think that nobody wants to read your important documents and see your family photo pictures and study your tax statements? Batch Encryption: wipe multiple files in a batch, wipe folders at one time. Master Shredder destructs files not only on FAT16 and FAT32 formatted hard drives and other media, but it includes special algorithms for NTFS formatted hard drives, it recognized and destructs NTFS compressed and encrypted files. Matching and exceeding the specifications of the U.S. Department of Defense to stop software and hardware recovery tools. 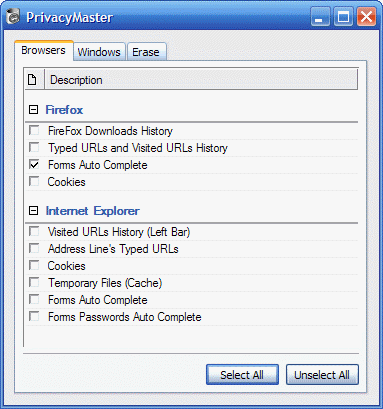 The latest version includes new tool: Privacy Master. It erases all personal traces on your computer: Visited and typed URLs in Internet Explorer and FireFox, Cache, Cookies. And also the list of recently open documents and many others. Bruce Schneier's Applied Cryptography (2nd Ed.) is the crypto Bible for the professional engineer and interested layman. It's a good survey of the state of the art in crypto techniques and protocols. You can also subscribe to and read back issues of Crypto-Gram, Bruce Schneier's monthly newsletter about cryptography. - Free upgrades to future version for lifetime! Our ordering page is on a secure server, ensuring that your confidential information remains confidential. As soon as we'll be notified that your order has been processed (usually in 20 minutes), we will provide you with the serial number which will register your copy of Master Shredder. If you would not like to use you credit card in the Internet, you can order Master Shredder by fax of phone; cheques, money orders and purchase orders are also accepted.